The style of the disc is dark and aggressive "melodic metal" (loosely defined as any metal with vocal melodies, as opposed to the popular alternative). Broadly speaking, NIGHTMARE's music is built on a classic metal template that incorporates elements of power and thrash, along with flashes of death, black and doom metal. The song structures remain generally concise, even though they are interspersed with progressive touches (orchestral and keyboard interludes, spoken word passages, sound clips and electronica) that actually enhance rather than distract. Apt comparisons include MYSTIC PROPHECY (aggressive power/thrash metal hybrid); JAG PANZER (orchestral parts and dual guitars); NEVERMORE (modern downtuned rhythmic riffing [in this case, 6-string as opposed to 7-string]); and NOCTURNAL RITES (riffing, harmonies, electronica). Note that this is not to imply that NIGHTMARE is a clone of any of these bands - but more on this topic later. The musicianship is professional throughout, but the focal point is Jo Amore's wicked voice, which really adds to the overall dark vibe. Fans of Pasi Rantaenen (THUNDERSTONE), Chity Somapala (ex-FIREWIND), Bjorn Jansson (RIDE THE SKY) and Ronnie James Dio will find a lot to like about Jo's performance. Guitarists Franck Milleliri and Matt Asselberghs follow the traditional dual guitar blueprint, employing a fair amount of harmony parts to offset their solos and power riffing. The veteran rhythm section of bassist Yves Campion and drummer David Amore (interestingly, Jo's brother) is solid and full, with some well-placed technical drum patterns. The production is good and more than up to modern standards; the drum sounds are crisp and distinct and the guitars are chunky and heavy. It's not a deal breaker, but the guitars could have been tightened up here and there - with more attention to the volume levels to avoid unwanted competition with the vocals. As a whole, The Aftermath is an able collection of songs that offer some interesting twists and turns. The writing can come off as a bit disconnected in spots (with a few abrupt endings), but there's nothing drastic enough to make things fall apart or drag. A few of the verses don't quite hit the mark, but the dependably memorable choruses make up for these misses. "Invoking Demons" is an example of NIGHTMARE's writing idiosyncracies; at certain points, it seems like it's going to stall, or that it went in the wrong direction, but somehow the pieces hang together. The same goes for "The Bridge Is Burning"; an introduction featuring keyboards, strings and a spoken word passage leads into a Tony Martin-era BLACK SABBATH-style tune with an unexpectedly doomy bridge. NIGHTMARE also gels on "Bringers Of A No Man's Land", "Necromancer" (the title alone is almost a free pass), "I Am Immortal" and "Mission For God" (with a familiar "Painkiller" feel). The Aftermath is on par with their previous three CDs: Genetic Disorder (2007), Insurrection (2009) and particularly The Burden Of God (2012). Through this series of releases, the band seems to have honed in on their sound and has delivered consistently. While not groundbreakingly original, NIGHTMARE has still managed a difficult feat; assembling a disparate number of influences and elements into their own style. 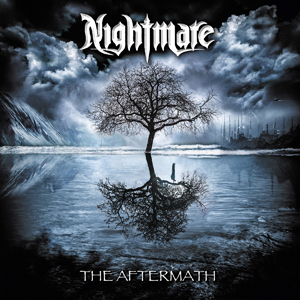 The Aftermath is a dark, moody, aggressive, slightly disturbing and ultimately intriguing listen from one of metal's better-kept secrets. Pick up your copy of The Aftermath in the KNAC.COM More Store right HERE. George Mihalovich is not only a contributing writer to KNAC.COM, but he's also the guitarist in East Coast metal rock act AFTERSHOK. Check them out at www.aftershok.com and on Facebook at www.facebook.com/AFTERSHOKMetal.